The July 9th NABA Meeting will be at 2:00pm back at Belmont University in the Massey Board Room. There will also be a meeting for the Board of Directors at 1:00pm before the general meeting. The one “change” is that we will be in a different meeting room. You will use the same driving instructions to get to Belmont and into the garage area. From there we will be a change, this month and this month only. You will enter off of Wedgewood the same way you would for our normal meeting room, but instead of veering left into the Ayer Academic Center garage, you will veer right into the Inman/McWhorter garage. We will have signage pointing guests to the Inman elevator to direct them to the second floor. Once you exit the elevator, there will be signs pointing you towards the walkway that accesses Massey Business Center. Once in the Business Center, signs will direct you to the elevator to the fourth floor of the Massey Business Center Board Room. This should not be too hard. We will have lots of signs. Our featured speaker this month will be David Cook from the UT Agricultural Extension Service, Davidson County Office. As beekeepers, we sometimes get totally focused on honey bees. However, there are many, many different types of pollinating bees in our environment. David will discuss the fascinating variety of other bees here in Nashville and how they are so different in many ways from honey bees. David will also talk about the exciting programs of the University of Tennessee Agricultural Extension Service in the area of plants for pollinating insects. 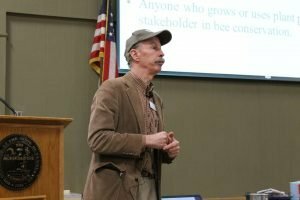 Lots going on right now for beekeepers. We will cover a full list of future events of interest, new NABA programs and volunteer opportunities for NABA members. Additionally, Joel White will do his ever popular “This Month in Beekeeping”. Because of the 4th of July, we will not be doing the Ellington Apiary informal and hands-on hive inspection training on the first Tuesday of this month. This month’s meeting at the Ellington apiary will be on Tuesday, July 11th at 5:30 pm. Joel White and Ralph Allen are the coordinators. 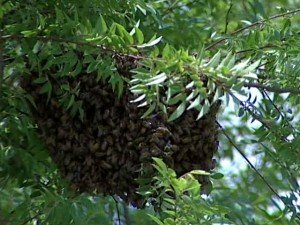 Kids Beekeeping Camp—Again this year, Trevecca University will be conducting a beekeeping camp for students in grades 5th through 9th. The camp will be each morning July 24th through 28th. Contact Jason Adkins at 615-812-3291 or jadkins@trevecca.edu . Heartland Apicultural Society Convention—Don’t forget, the annual convention for the Heartland Apicultural Society will be in Evansville, Indiana, July 13th -15th. All the national experts will be there.